The carbonate anion shown below has one double bond and two single bonds. Normally, the number of bonds between two atoms in the Lewis structure can tell you how closely the two atoms are held. That means there is one C-O bond in the molecule that is shorter than the other two. However, carbonate ion is an exception to the rule. In fact, carbonate ion is a symmetric, trigonal planar molecule. All three carbon-oxygen bond distances are about 1.28 Angstroms long. You cannot draw a Lewis structure that would suggest all three bonds are the same length. Instead, you can use resonance structures to understand this fact. Resonance structures are just alternate Lewis structures that take into account different possible arrangements of lone pairs and multiple bonds for a given skeletal structure. In carbonate, there are three ways to arrange these extra electrons. 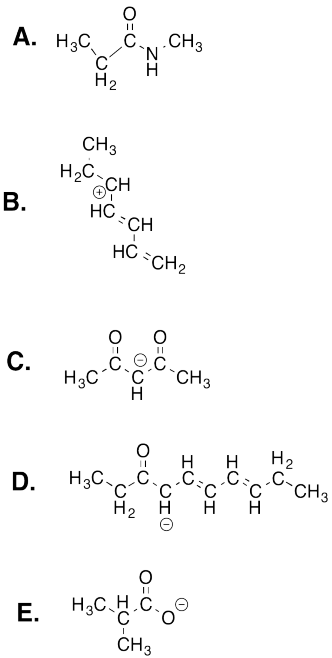 If you label the oxygen atoms A, B and C, as shown below, then A has a double bond in 1/3 of the structures you could draw, but it would have a single bond in the other 2/3 of the ways in which you could draw the structure. The same is true for the atoms B and C.
In fact, carbonate really has about 1-1/3 bonds between each carbon and oxygen. Furthermore, there is not a full negative charge on any of the oxygens but about two-thirds of a negative charge on each of the three oxygens. Occasionally we might draw a structure that shows partial bonds between atoms as dashed lines to suggest, in this case, 1-1/3 bonds instead of either one bond or two. We might also write  ("delta minus") to denote a partial negative charge. The limitation of this type of drawing is that it fails to show us exactly how many electrons we are dealing with. Later in the course, it will be very important to keep track of all the electrons in molecules as they undergo chemical reactions. Consequently, we almost always draw out different possible Lewis structures and keep in mind that the structure is something like a combination of all of them. When we have structures that differ only in the way their electrons are arranged, but have exactly the same connectivity between the atoms, we refer to the set of structures as resonance structures. The double ended arrows between the resonance structures is the symbol we use to say that we have two or more different ways of drawing the same structure, and that we need to take all of the structures into account to understand how the molecule really behaves. There is a subtlety here. The compound is not one structure or the other, and it is not an equilibrium where the structure changes back and forth rapidly. It is a superposition, in which a single molecule can behave like all three structures at the same time. Draw sets of resonance structures for the following compounds. All of the bonds in benzene (below) are the same bond distance (1.39 A). Show why this is true. There are several resonance structures for each of the following ions. Show at least three for each. Ions can be greatly stabilized by delocalization. That is, if a charge can be spread out over several atoms by resonance, the charge is more stable. Use this idea to predict the relative stabilities of the following ions (rank them from most stable to least stable). 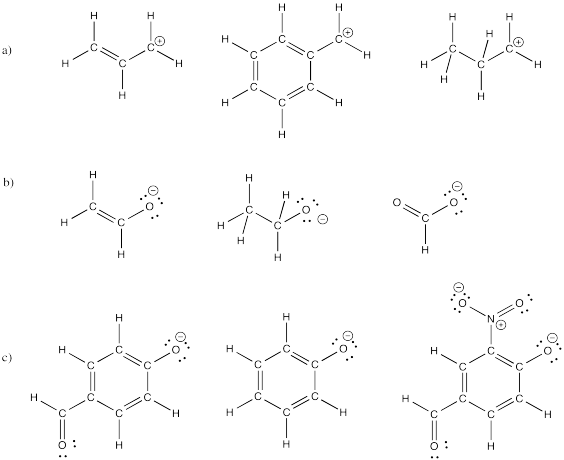 Draw resonance structures for the following molecules.